The music of Prince is being brought to the stage in venues around the United States and Europe this autumn in brand new arrangements for 27-piece orchestra as the new show 4U: A Symphonic Celebration of Prince began its 50-date tour this past weekend with shows in North Carolina and Georgia. Prince died in 2016 and his estate is honouring his incredible back catalogue by asking drummer and creative Questlove to oversee and curate a new show consisting of both his greatest hits and some deeper cuts. Among the orchestrators Questlove turned to was long-time collaborator D.D. Jackson – an accomplished jazz pianist, composer, producer, recording artist, and educator – and D.D. turned to Dorico to help him realise these new arrangements. I recently caught up with D.D. to find out about the project. D.D. Jackson is a recording artist with a dozen successful CDs to his name, an educator for both jazz studies and media composition at Brooklyn College and their Feirstein Graduate School of Cinema, an Emmy award-winning composer for television, an orchestrator, and more besides! 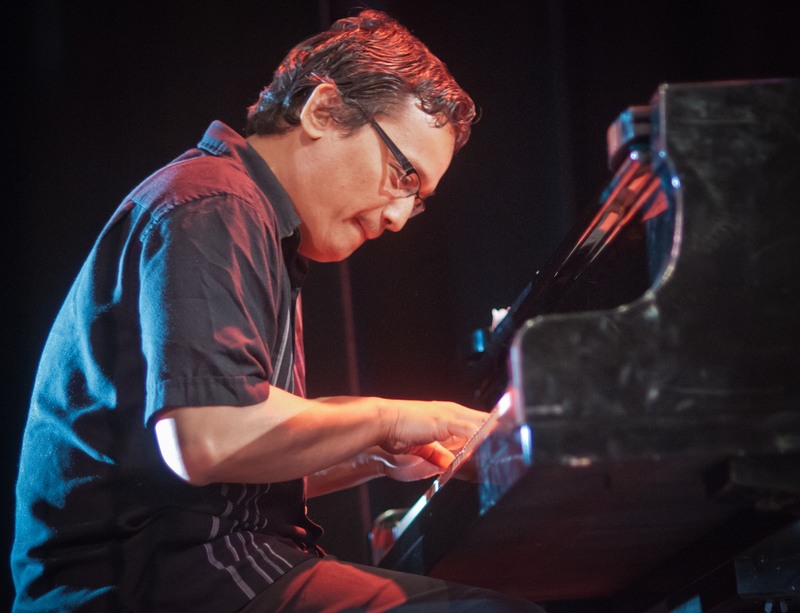 He has collaborated with Questlove and The Roots many times, most recently playing keyboard with them at Madison Square Garden for the John Lennon 75th Birthday Concert and at Radio City Music Hall. He’s a very busy man, so with the Prince show now out on the road and all the orchestrations completed, it was good to be able to catch up with him to find out more. DS: It was good to meet you in person for the first time this summer in New York. We must have first met virtually something close to 20 years ago via the Sibelius chat page, but when we finally met it was because of Dorico, not Sibelius. D.D. : That’s right! I had been a dedicated Sibelius user since version 2.0 but was eyeing Dorico ever since you and your colleagues from the original Sibelius team announced you were working on it, several years ago. This summer I finally had the chance to fully dive into the program – and I resolved that I would also attempt to use Dorico exclusively for my next big project. That project ended up being another collaboration with Questlove of The Roots as an orchestrator for 4U: A Symphonic Celebration of Prince, currently on tour in multiple U.S. cities. DS: You and Questlove move in the same circles in the New York music scene, and you’ve worked together many times, so I guess it was no surprise to get the call for this project. D.D. : Yes, I’ve had the pleasure of working with Questlove for several years on a variety of projects and even played with him on the Jimmy Fallon show. Often deadlines are very last minute – as is also typically the case in one of my other regular activities, writing music for television – and this project was no exception, as I had just a week to orchestrate eight tunes, including perhaps Prince’s most famous piece, “Purple Rain”, during one last-minute, all night session. The incredible thoughtfulness and thoroughness with which Dorico is laid out, therefore, was absolutely essential in contributing to the success of the project, and in simply making the required deadlines. DS: Tell me a bit about the workflow you got going with Questlove on this project, then. D.D. : My method was perhaps a bit round-about — but it worked! Questlove originally sent me mock-ups of his ideas as MP3s, but once I got my hands on the Pro Tools sessions, I exported the individual audio tracks into Logic Pro, my normal DAW of choice, where I beatmapped the tempo and did some basic arranging of some of Questlove’s ideas using virtual instruments. At this point, I exported a MIDI file of the entire Logic session, which also served as a Tempo Map, and brought it into Dorico. Next, I bounced the actual audio from Logic as a stereo file, attached it to a video file with just a static image, using iMovie, and imported the video into the same flow in Dorico using its handy video syncing abilities. The end result was a Dorico flow with the unedited MIDI data, the exact tempo map, all synced to a reference mp3 mock-up from Logic I could continue my orchestrations to. 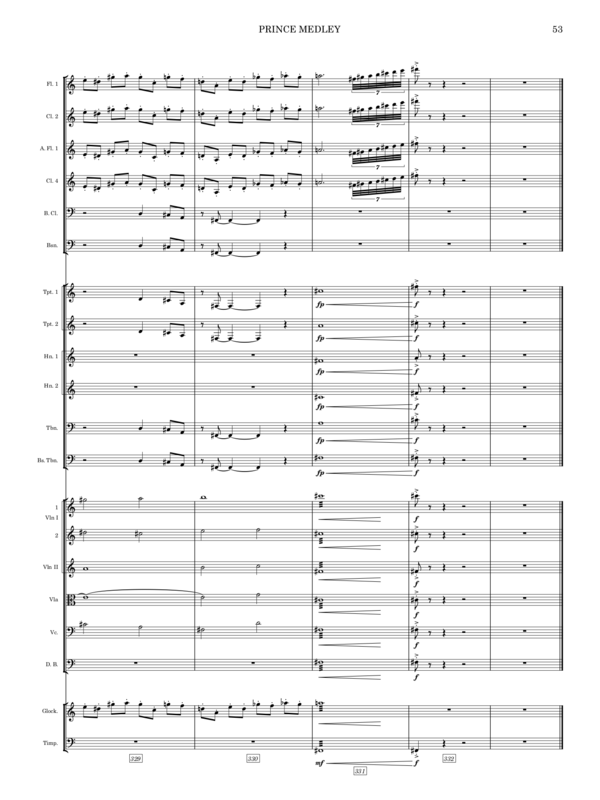 A page from one of D.D.’s orchestrations for the 4U show. DS: That’s quite an ingenious use of some of the new features we added in Dorico 2. How did you find the workflow within Dorico itself, once you got there? D.D. : This is where Dorico’s editing abilities really shone through, including of the original imported MIDI data. I was also particularly pleased with Dorico’s implementation of divisi, and its ability to change instrumental parts so easily and logically on the fly. This was especially helpful because the instrumentation included six woodwind players, each doubling on up to four instruments, plus strings, brass, and two percussionists. Because I was working fast, it was also incredible to be able to use NotePerformer for quick and accurate interpretation of my score based entirely upon the written notation! For the first time, I was even able to bounce the synced score/imported MP3 mockup as a useful reference for the conductor, while in the past this was something that had to be first accomplished entirely within my DAW for greater realism. DS: Since you’re such an accomplished keyboard player, I know you are waiting for Dorico to include real-time MIDI input, and we’ve been using some of your Logic sessions as test data to improve our MIDI transcription in preparation for that. D.D. : Yes! The addition of real-time MIDI recording, combined with Dorico’s current ability to use virtual instruments and edit their MIDI controller data, is truly the Holy Grail I’ve been waiting for, since I will finally be able to potentially do all creative work within Dorico, and go back to composing directly from the score and producing high level, finished output suitable to send to clients. On the whole, though, Dorico is truly the future of scoring and I am eagerly awaiting what’s next in store for the program –– and you certainly have already accomplished a dizzying amount in such a short period of time, with each new feature immediately becoming “best in class”. DS: Thanks for taking the time to talk to me, D.D.! D.D. : My pleasure — and thanks to the Dorico team. To find out more about D.D. Jackson, visit his website. To find out where 4U: A Symphonic Celebration of Prince is touring this autumn and to buy tickets, check out the tour schedule. If you haven’t yet taken Dorico for a spin yourself, a fully-functional 30-day trial version is available here, allowing you unlimited use of Dorico’s features, included sound content and all.